Catnoir is a501c3 non profit Animal Medical Welfare Charity raising funds / awareness for medical research and well being for our 4 paw friends. Being a medical imaging professional our charity is aligned to the advancement of imaging, surgical procedures and techniques using innovative technology for the treatment of injury and disease. Please consider joining CATNOIR in our journey to support cats, dogs and small animals. They need our care, understanding and support for the provision of daily essential needs, and the right to quality of life in a loving environment. Working with corporate and business partners bringing valued services to the community. For our families, one of the most devastating experiences is to have our PAW family members suffer with sickness, injury or death. To loose those who have been our children, companions, best friends, and held a special place in our heart can be overwhelming. The departure of our PAW family members is a time of both great love and sorrow, letting them leave for what we hope is a better place. As our hearts mend there are many PAW friends waiting for a chance to make a place in your heart to become that special PAW family member. We wish for all those animals that struggle with homelessness, sickness or risk of euthanasia to be adopted into loving families and homes like yours today. By joining our cause you can make a difference in an animals life today by providing donating or sponsoring our cause that supports daily care, food, shelter, medicine, necessary surgical procedures and animal rights. Personally we have lost many PAWfect companions and would like to make a difference for all those who share in our same love of animals. As owners of many kinds of PAW friends, we have given a home to almost anything we can. 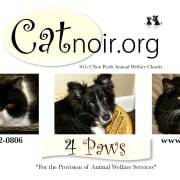 Please consider participating with CATNOIR.org in our journey to support cats, dogs, horses and small animals. They need our care, understanding and support for the right to quality of life in a loving environment.